If you were successful in growing beets this summer and now have a great supply from your garden, storing beets for winter is the next step to take. Beets, as well as carrots, potatoes, and cabbages, are good keepers. Mostly canned or pickled for winter storage, very young beets are good frozen. Also, fresh beets are easy to store using some "old-fashioned" ways if you have a root cellar or a similar cool space in your house. Select beets that are small, tender, of uniform size and unblemished. You need to fully cook the beets for freezing – raw beets don't freeze well (they turn rather grainy when frozen). Prepare and cook whole beets unpeeled. The easiest way is to boil in water, but you can use a vegetable steamer , or a pressure-cooker. When fork-tender, cool and peel the beets quickly. Small beets can be frozen whole. 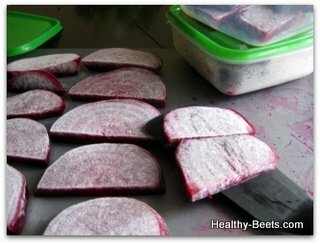 Cut larger beets into 1/4" slices or cubes. It is best to tray-freeze the beets first, by spreading them on a tray or baking sheet in one layer and freezing. Then, pack into freezer bags or containers and store in the freezer. You can also try freezing beet greens for a quick healthy side dish in the dead of winter. Select young, healthy, unblemished leaves, preferably with tender stems. Remove any tough ribs and wash thoroughly. Blanch 1-2 pounds at a time in boiling water for no more than 2 minutes. Cool the greens quickly and drain, then pack in into freezer containers with the water still clinging to the leaves and freeze. Lay the greens flat in the bags or containers while freezing so that they take up less space in your freezer. Another way is to wilt the leaves by stir-frying over high heat for 2-3 minutes, then cool and place in the containers to freeze. To use, thaw the frozen greens at least partially, and cook according to the recipe. If you prefer storing beets fresh, try this traditional method of packing root vegetables in sand for winter storage. You will need storage containers (the best is a wooden crate or a box - plastic might not "breathe"), clean, dry sand, and a permanently cool, but not freezing, ventilated place like a root cellar, unheated pantry, or an insulated garage. Optimal temperature recommended for storing beets is 1-4°C, or 33-39°F, at 85-95% humidity. It is very important to select unblemished healthy vegetables for storage. Trim beet leaves, keep the tap root intact, and do not wash the beets, just brush the dirt off careful not to scratch beet skins. Let the roots dry a little before putting away for storage. Place a layer of sand in the container, lay the beets on top, put another layer of sand, another layer of beets, etc. Cover with sand. The beets will keep for up to 5 months. If you can, it is a good practice to check the beets for spoilage during the winter months once or twice. Dump all the sand with the beets out, sort out any that might have started to rot, and re-pack in the same sand. When you need beets in winter, just dig out a few vegetables from the top layer. Still looking for more ways to store beets? Check out our fermented beets recipe. Or click here for a quick pickled beet recipe. How do you store your beets?